We're totally stoked to be able to announce a MUCH and LONG requested site improvement. You can now organize your bookmarks!! Instead of sifting through all of your threads in a single list looking for whatever you need, you can now organize your bookmarks into convenient folders, to keep your inspiration separate from interesting questions, and tutorials separate from what you just think is totally cute! If you go to your bookmarks, you'll now see a new section above your list of bookmarks, called Bookmark Folders. You can use folder to easily organize your bookmarks however you see fit! 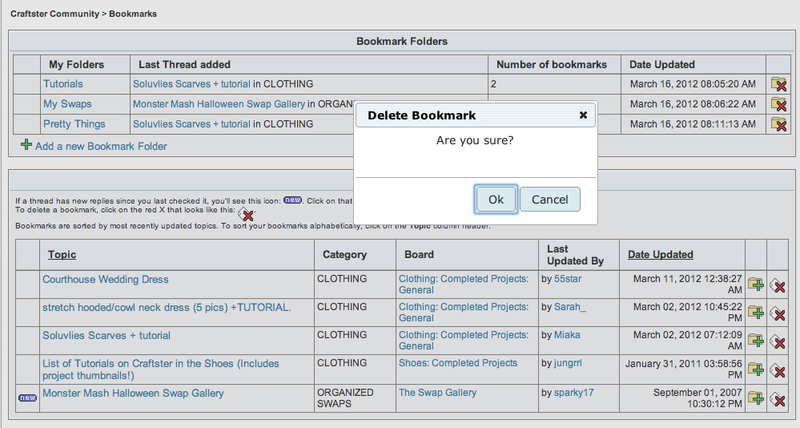 Adding a new Bookmark Folders is easy, just click this link in the Bookmark Folders area. When you click that link a dialogue box will appear. You can type in the name of your new folder, and hit Add. Now your folder will show up at the top of your Bookmarks page in the Bookmark Folders area. Adding your bookmarks to folders is easy, too! Simply click this icon next to the bookmark you want to file. 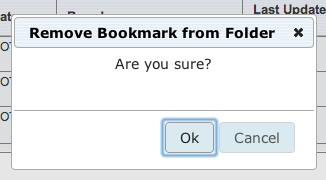 Again, a dialogue will pop up asking you to select the folder in which you'd like the bookmark to appear. After you click add, you can see that the thread has now been added to your folder! The Bookmark Folders area will only display the last topic added, but you can just click on the folder title to access ALL of the bookmarks within it. You can also still see ALL of your bookmarks as one single list right below the folders area. They will not be removed from this list when they're put into folders. Here you can see that I've added some new folders and added topics to some, but not all. If you want a specific thread in two different folders, you can do that! Just go through the process again and select the other folder in which you'd like the thread to appear. You can see here that I have the same thread in both my Tutorials folder and my Pretty Things folder. If you accidentally selected the wrong folder when you added your thread, or you decide you'd like to refile it somewhere else, just go into the folder you're moving FROM and click this icon next to the thread you'd like to move. This will give you a dialogue box with only the other bookmark folders listed. Simply choose where you'd like to move the thread to. If you would just like to remove a thread from a specific folder, just click this icon while you're within the folder where the thread appears. This will bring up a dialogue box asking you to confirm your request. This will only delete the thread from the folder, it won't delete it from your bookmarks entirely. If you want to remove a thread from your bookmarks entirely, simply go your full Bookmarks list and click this icon. You will need to verify that you do want to delete the bookmark entirely. Once you've done that, you can see that it is removed from your Bookmarks list AND from any Bookmark Folders where it previously appeared. Once you've got your folders all set up, when you add a new bookmark, you can now add it directly to a folder if you wish! Also, if you've made it to the end, here's another exciting mini-announcement! Just as you can jump to a specific page in a thread, you can now do that with an entire board! Wanna see all the cool stuff posted year ago? Just select a page of the board in the drop down and go there instantly! 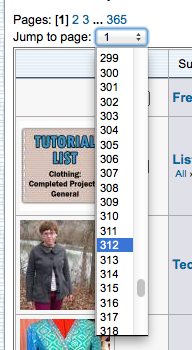 You'll see this "Jump to page:" drop down in all boards. and once you select the page, you'll get taken right to that page! Re: 03/16/12 - Bookmark Organization is finally here! yippee!!!!!!!!! that'll be so nice to have them all organized, and much easier to find! Oh wow, oh wow, oh wow! This is fantastic! On behalf of my overly-long bookmark page, I thank you. You guys are absolutely incredible!!!! Thank you so much!!! Probably take me forever to figure it out but I'll get there. This is so great! You Guys Rock! I feel your pain. I scroll for ages on mine! Whoo hoo! Thanks - organized tutorials! My organized self applauds you! This is the best news I've heard all day! I'm so stoked, thank you so much!!!! Fantastic! This is going to to make such a difference!